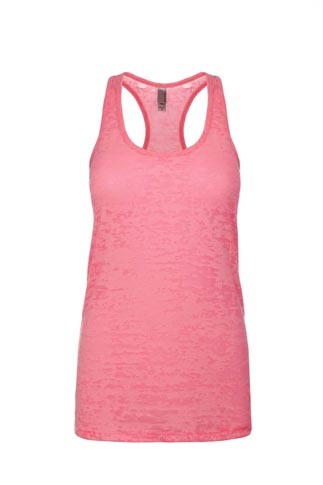 - Next Level Ladies 3.7 Ounce Burnout Racerback Tank. - 65/35% poly/combed ring-spun cotton burnout fabric racerback tank. - 30 singles, 3.7 ounce. - 1x1 baby rib binding. - Due to the unique burnout process, some color shade variations may appear from garment to garment. Next Level Ladies 3.7 Ounce Burnout Racerback Tank. 65/35% poly/combed ring-spun cotton burnout fabric racerback tank. 30 singles, 3.7 ounce. 1x1 baby rib binding. Satin label. Due to the unique burnout process, some color shade variations may appear from garment to garment. Sizes XS-2XL: White, Black, Dark Gray, Neon Green, Neon Orange, Neon Pink, Purple Rush, Royal, Shocking Pink, Tahiti Blue.